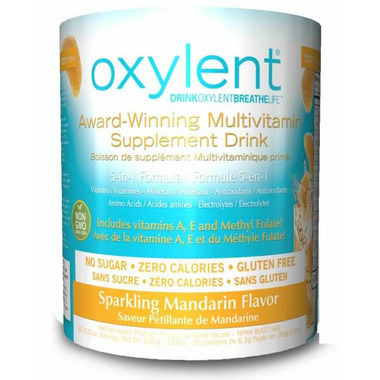 Oxylent is an award winning, 5-in-1 daily multivitamin - all in one refreshing drink! Add a scoop of Oxylent to water and enjoy a sparkling drink that delivers vitamins, minerals, electrolytes, amino acids and antioxidant with easy absorption at home, in the office or at the gym! Adults: 1 level scoop (provided) which is equivalent to 6.3g; children over 5yrs - 1/2 a scoop or 3.2g. Mix with 4-6oz of water or to taste. Ingredients: Vitamin A (as retinol palmitate, beta carotene), Vitamin C (as calcium ascorbate), Vitamin D (as cholecalciferol), Vitamin E (as d-alpha tocopherol), Thiamin (as thiamine hydrochloride), Riboflavin (as riboflavin-5-phosphate sodium), Niacin (as niacinamide), Vitamin B6 (as pyridoxine hydrochloride), Folate (as 5-methyltetrahydrofolate), Vitamin B12 (as methylcobalamin), Pantothenic Acid (as d-calcium pantothenate), Calcium (as calcium ascorbate, DimaCal dicalcium malate), Iodine (as kelp), Magnesium (dimagnesium malate, magnesium lysinate glycinate chelate), Zinc (Zinc bisglycinate chelate), Selenium (as selenium glycinate complex), Manganese (manganese bisglycinate chelate), Chromium (chromium nicotinate glycinate chelate), Molybdenum (molybdenum glycinate chelate), Sodium (as sodium bicarbonate), Potassium (as potassium bicarbonate, potassium glycinate complex), L-Arginine, Lysine (as lysine hydrochloride), Superoxide Dismutase (SOD), Citrus Bioflavonoids, Coenzyme Q10, Boron (as bororganic glycinate complex) (Bororganic Glycine), Other Ingredients: citric acid, natural fruit flavors, rebaudioside A (stevia leaf extract). Absolutely love this product. My favourite flavours are the orange and blackberry. I have a bunch of digestive issues and find I'm better able to absorb vitamins in this format. They use the better form of b12 in it. Energy is great and rarely sick since I started using a couple of years ago.